The Safety 1st Sounds n Lights Discovery Walker Dino is a dinosaur themed baby walker which keeps your little one entertained while making sure they are learning to walk. 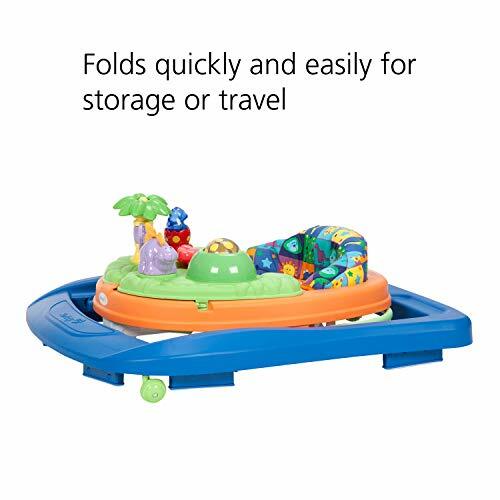 The walker comes with 2 swing activity trays with a folding frame. There are dinosaur themed toys on the front panel of the walker to keep your baby occupied while they learn how to walk. The walker is designed to keep the baby safe and comfortable, as the Safety 1st Sounds n Lights Discovery Walker Dino comes with a padded seat and there are grip strips underneath to keep the movement at a lower level on uneven surfaces. The baby walker is adjustable at three heights, so as they grow up, you can adjust your baby according to their heights. Thus you can use this walker for a long time thanks to this feature. The adjustable baby walker is 24 inches long, 28.1 inches wide and 22.5 inches high. The product weights 11 pounds, so it is easy for you to move around, but at the same time, it is sturdy enough so that your baby won’t topple over. The safety 1st sound n lights activity Walker front panel is interactive with five vibrantly colourful dinosaur toys which make sounds and music along with lighting. For example, the purple dinosaur toy turns with a clicking sound, and its fins are creased. There is a spinning potato bug toy which makes noise as there are small beads inside of it. There is a springy palm tree as well. And the dinosaurs lights up with 4 different sounds when pressed. The plus point is, the sounds are not obnoxious or loud and are rather pleasing even to the older ears as they are quite subtle. 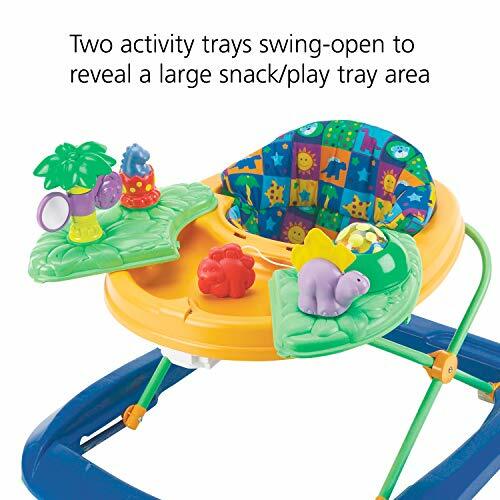 There are two swinging open trays on the sides which are useful to keep more toys and bowls while feeding the baby. The toys on the main tray are removable as well to make more space at the front if necessary. The safety 1st sound n lights activity walker comes with an adjustable feature of setting the seat at three heights, which means your baby can use this walker while growing up and it will last for a long time as the height of the baby increases. The walker is easy to use both for the baby and the parent. The safety 1st sounds n lights activity walker manual assembly is easy and takes five minutes to set it up. The adjustable heights come in handy when a growth spurt strikes. The padded seat is washable and just throwing it in the washer is enough to get rid of any mess that might occur during feeding time. The extra swinging trays are easy to store extra toys. The Safety 1st Sounds n Lights Discovery Walker Dino is easy to store as well. As the weight is adjustable and it can go on the low setting, even though it doesn’t go completely flat due to the seat. However, this adjustable baby walker you can store it away easily under a table and keep it out of the way when the baby is not using it. This safety 1st baby walker is safe for using as there are Grip strips to reduce movement on uneven surfaces. It will also save the baby from toppling over, even if they slam into furniture or walls, as most babies tend to do when they first start learning to walk. Safety 1st Sounds n Lights Discovery Walker Dino is sturdy enough to make sure that the baby doesn’t topple over, so it’s safe from producing any serious injury. It is safe for your house and appliances as well, as the edges are smoothed and well rounded so that your stuff won’t scrape off while your little one bumps into them. 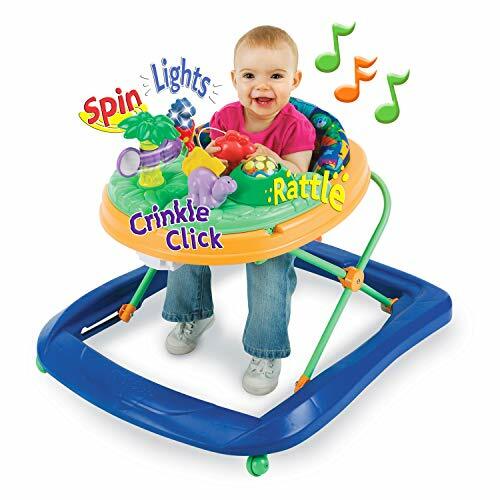 The safety 1st sound n lights activity walker is a durable walker. 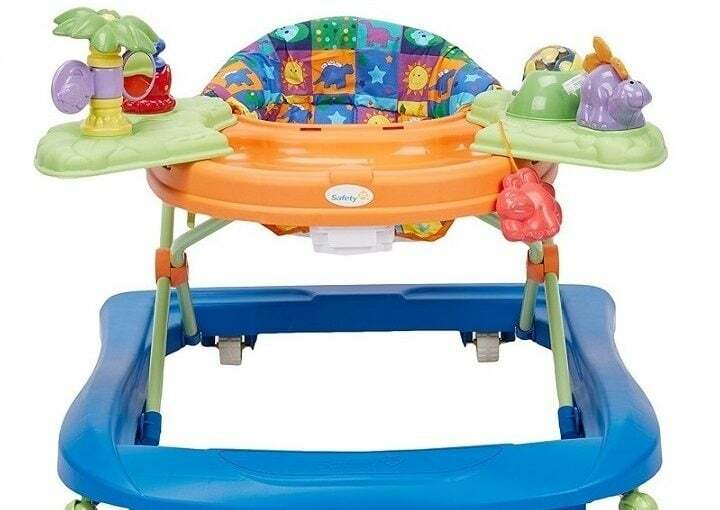 The safety 1st baby walker structure is well made with steel, and the toys panel is made of sturdy plastic. The parts don’t get broken and set apart even when the toddler clashes with furniture and walls. This, in essence, makes the walker even safer as the baby is protected from breaking a part of the walker and then cutting a body part on it. Now I will talk about some pros and cons of using the safety 1st sound n lights activity walker. Easy to clean as the seat is washable. Three adjustments make it usable for a longer period. Interactive panel keeps the baby entertained. Durable with steel structure and sturdy plastic panel. There is no option to lock the wheels down so keeping the baby stationery is not an alternative. Q: Can the toys be removed from the tray? Q: Do the wheels move in every other direction or only forward and backward? A: The front wheels swivel and the rear wheels are stationary. Q: Can you fold the walker completely flat for easy storage? A: It does fold down, but it’s not possible to make it completely flat. Q: Will the Walker scrape off my furniture and walls? Overall, the safety 1st sound n lights activity walker is a decent buy if you consider the benefits and the price. The walker is cute and interactive with all its dinosaur themed toys. It will last a long time due to its sturdy structure and adjustable seat positions, so the baby won’t be outgrowing it too soon, which is always a plus point. I will recommend the safety 1st sound n lights activity walker to parents who are looking for a walker as their baby starts to learn to walk. This walker will work for a long time, and the baby will be happy and occupied with the toys. The walker is safe as it doesn’t topple over or break away easily, so there is a less chance of the baby getting an injury while using this walker. I hope this review will help you make the right decision.